Helis offers a range of heavy duty diesel forklift variants from 12 Tons to 16 Tons. Available with Cummins Engines, the wet disc brakes of these monster machines improve the braking efficiency and the special gearbox ensures a reliable performance. 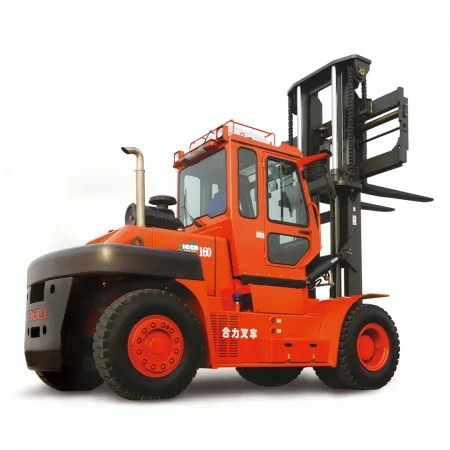 The electronic instrumentation, suspended cab and inching pedal are other impressive features that make these heavyweight forklifts sure winners on your worksite. You can choose the forklift that is most suited for your business with many specialised attachments. And if safety is your top priority, we can even configure it for explosion proof applications. Hala Equipment Trading is the sole distributor of Heli Forklifts, Warehousing Equipment, Wheel Loaders, Attachments and Tow Tractors in the UAE. Heli is the No.1 in China and one of the the world’s top ten forklift manufacturers. Our after sales service extends across all Emirates of the UAE including Abu Dhabi, Dubai, Sharjah, Ras Al Khaimah, Fujairah, Umm Al Quwain and Ajman. A unique feature of our service division is our fleet of service vans which are kitted for carrying out comprehensive service at your desired locations. We are always ready when and where you need us. Our service team includes more than 30 qualified staff for handling all kinds of service and repairs. With extensive experience, each service engineer has practical, hand-on knowledge of service and repairs of heavy equipment, covering Mechanical, Hydraulic, Transmission, Electric and Electronic systems. Their knowledge is further enhanced by specialist training from Heli. To ensure uptime, this expert team is backed by an extensive stock of spare parts, with critical parts stored in a climate controlled environment.